What is the PhysioRoom.com Advanced Hinged Knee Brace ? This high quality, advanced hinged knee brace, with Airmesh four-way stretch fabric for a custom fit, features wrap-around Velcro straps that make it easy to put on. 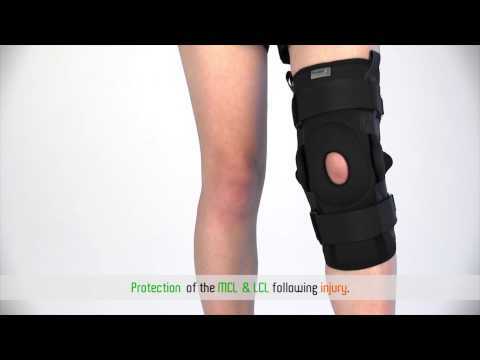 Protects the knee following ligament sprains, cartilage tears and mild arthritis. Measure around centre of the knee. If you are between sizes, please choose the larger size. This product can be used on either the left or the right knee. This PhysioRoom.com Advanced Knee Brace features a Dual Pivot Hinge which holds the knee in a stable position, helping to prevent flexion and extension, thus protecting the joint from more damage. The brace's wrap-around straps enable you to put it on without pulling it over the foot and lower leg. A popliteal opening behind the knee makes it comfortable to wear, while a gel-filled surround holds the patella firmly, prevents displacement of the knee cap and provides gentle massage. Its four-way stretch, multi-filament fabric ensures a supportive fit and comfortable cushioning and because its breathable construction allows air to circulate freely, the Advanced Knee Brace can be worn for extended periods of time. Regular use of the knee brace can reduce muscular tension and swelling, while speeding up recovery. Fitted with a soft gel patella cushion and hinge for support around the front and sides of the knee joint. Made with Airmesh four-way stretch fabric to bring warmth to the joint and for optimal comfort. PhysioRoom Advanced Hinged Knee Brace - Wrap Around Knee Support for Rehab & Pain Relief is in stock and available for immediate dispatch from our Warehouse facility in Lancashire, UK. Orders placed by 4pm Monday to Friday (excluding Bank Holidays) are dispatched the same day. If you need your PhysioRoom Advanced Hinged Knee Brace - Wrap Around Knee Support for Rehab & Pain Relief in a hurry, next working day delivery is available for UK mainland addresses.